I awoke to a lawn mower…a signal for a second day of sun! I had planned to head inland today to Crater Lake, but passing up a sunny day on the coast of Oregon seemed ludicrous, especially since it will be my last day on any coast for five months. VANilla took us from Bandon to Cape Arago where we visited a couple of state parks. 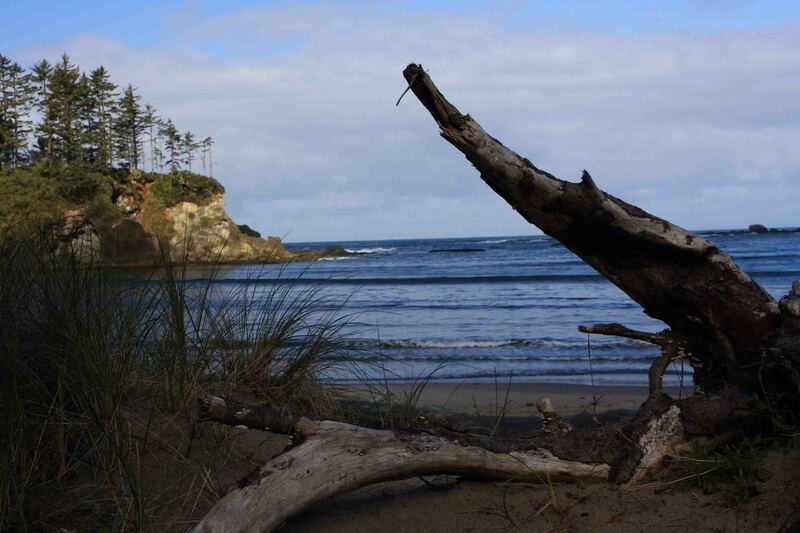 The first, known as Sunset Bay State Park, includes one of the calmest, safest swimming spots on the coast. I took Reader’s Digest’s word for that, and didn’t try swimming as I watched a long boarder paddle around the tranquil harbor in a wetsuit. After a short stroll along the beach, we moved on to Shore Acres State Park. 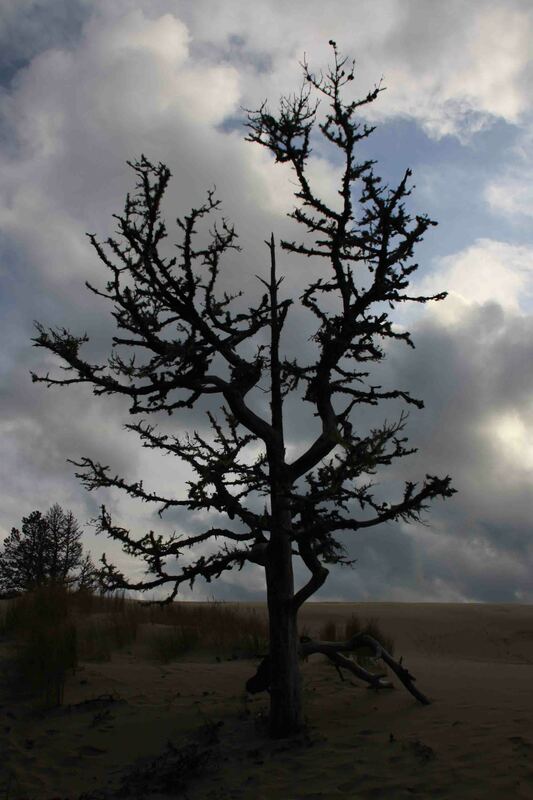 Shore Acres State Park was once the estate of timber baron Louis J. Simpson. We parked on the side of the road, took in a view of a lighthouse, and then took a lovely path shaded by Douglas firs and lined with ferns into the park. The trail, which allowed dogs, led us to a park with signs posted, “Animals Prohibited Outside of Vehicle”. I don’t think I’ve seen a no dogs allowed sign worded quite like that. After glancing at the sign, I saw a pet owner with his dog off leash playing in the median of the parking lot. I’ve yet to enter a park where dogs weren’t allowed in developed areas, so I just stuck to the paved trail that led us to a spectacular overlook. 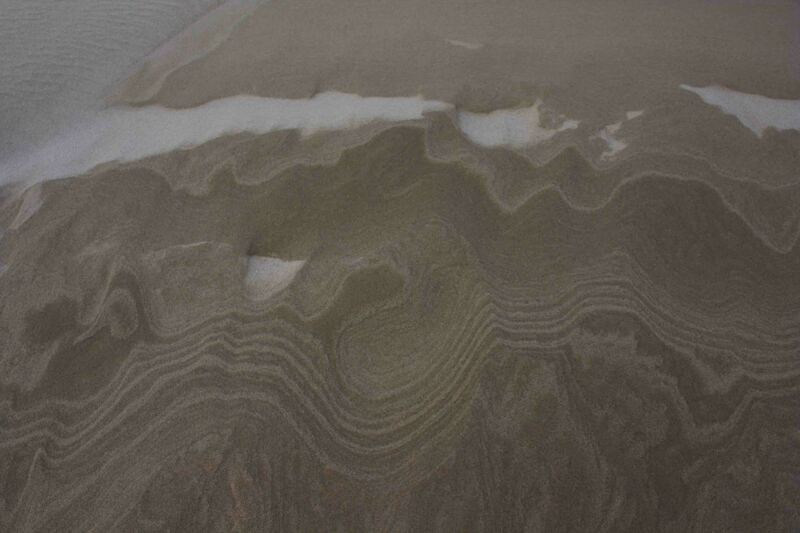 Waves crashed into the rocky shores below. We continued around the edge of the cliff and admired the English and Japanese gardens from afar before we returned to the trail that led us into the park. I suspect this park will be a busy place this summer or on a lovely, weekend day. 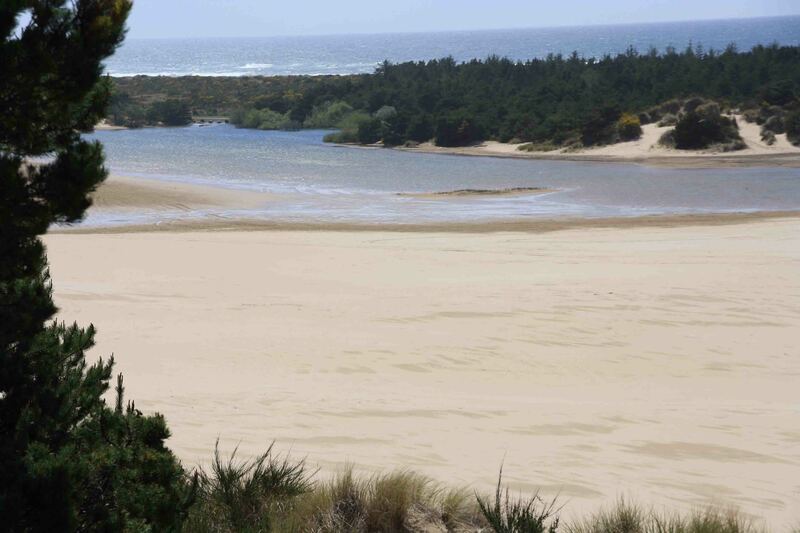 From Cape Arago, we passed by famous Bandon Dunes Golf Course, Cools Bay and had planned to stop for a hike in the Oregon Dunes National Recreation Area. 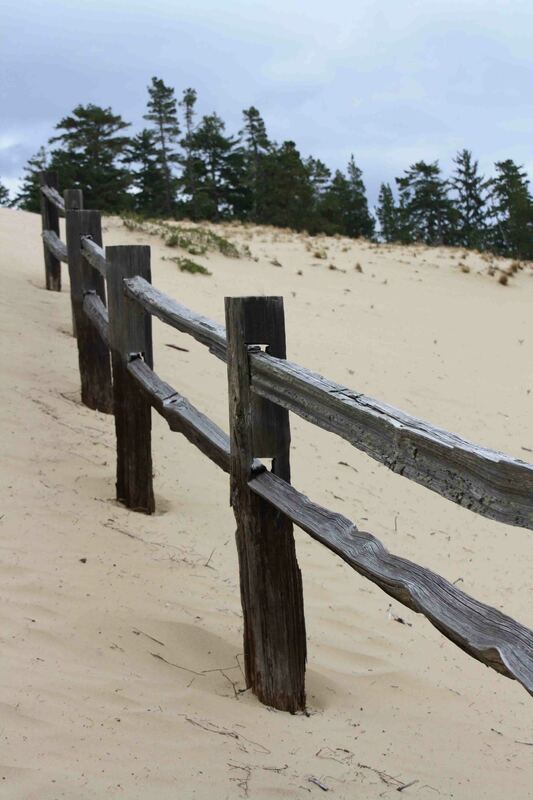 The cream-colored sand dunes stretch for 41 miles along the coast. 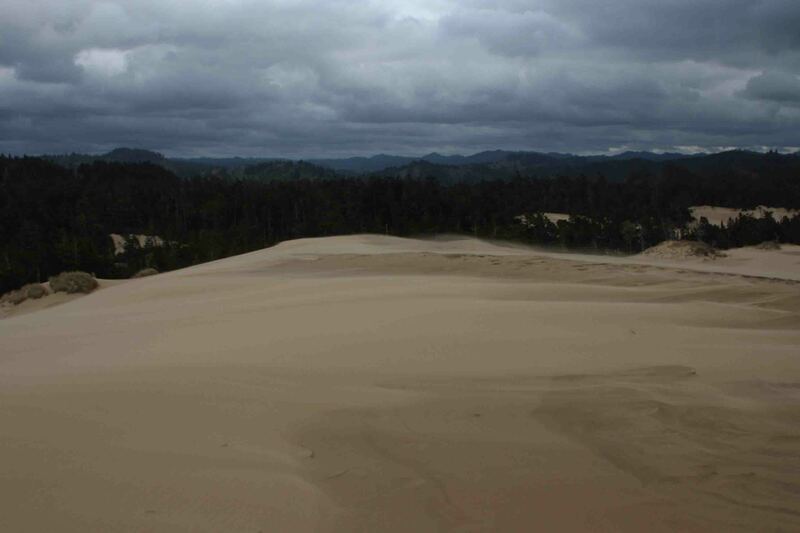 There were countless places to stop, but I missed the Eel Creek Campground turnoff which according to Reader’s Digest affords the best views of the undulating dunes. Without a map of trails that wind through the 32,000 acres handy, I decided I would visit the area on my return to Coos Bay where I found a Wal-Mart for the evening. Our journey up the coast continued to Umpqua Lighthouse State Park. 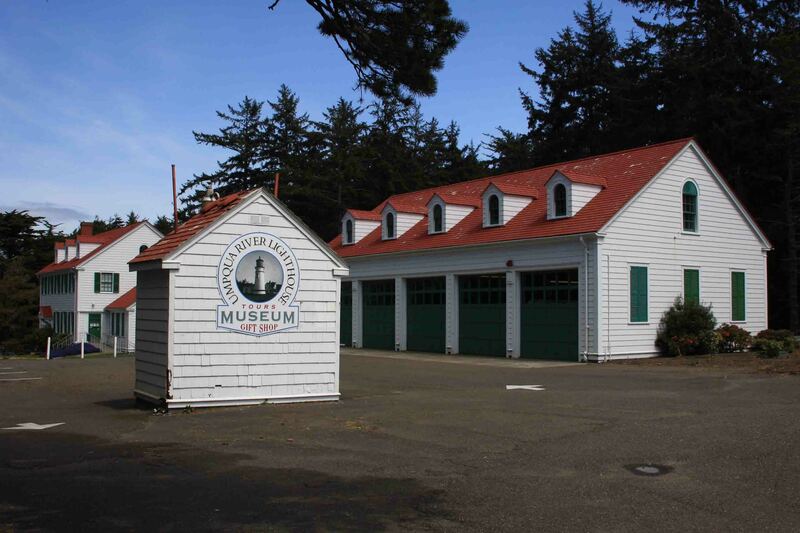 The original Umpqua River Lighthouse was the first lighthouse in the Oregon Territory. Built in 1857 by the mouth of the Umpqua River, it was destroyed by flood in 1861. A new lighthouse, built on the bluff, replaced the original in 1894. The guiding light changed from oil to electricity in 1934 and its signal to mariners is 2 white flashes followed by 1 red flash. As I stood on bluff looking out to sea for whales which I learned for the nearby exhibit the likelihood of seeing one now is low, it dawned on me that the lighthouse might be a virtual geocache. Surprisingly, my phone had full 3G service and I found that while the lighthouse wasn’t a virtual cache, three caches were hidden in the park. One was just around the bend of the bluff at the lighthouse museum which was hidden from view…a good example of why I like to cache. I would have never known a museum was only 300 feet away from where I was standing. Given April is still considered winter in Oregon, the museum was only open on weekends, but just meandering around the quaint, old buildings suited me. 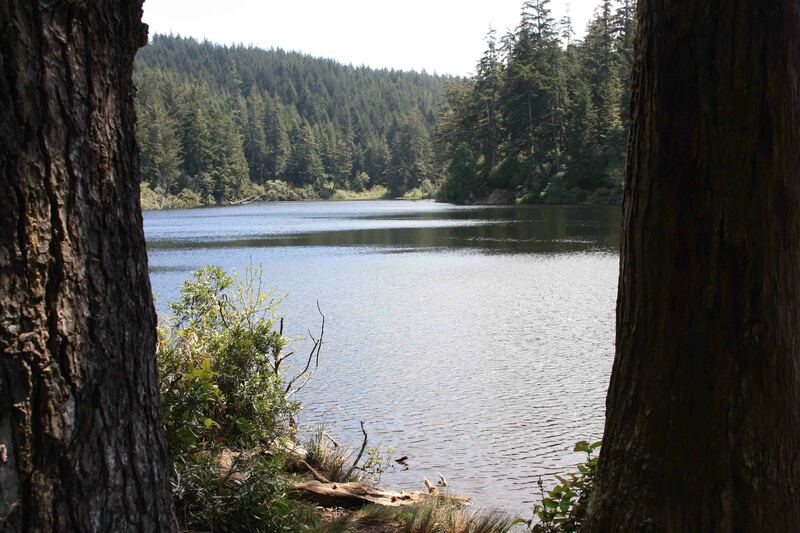 The two other caches were located along a path that circled Lake Marie framed by spruce, pine, and hemlocks. As Petey and I started down the loop trail, I thought to myself, I can’t believe it is my last day on the coast, and I’m walking around a lake beneath trees. It defied all logic in my book, but it was a very peaceful walk. It would have been better if I could have found both caches though! The first one, I snapped up quickly. The location of the second one led me on a spur trail toward the dunes and ocean where people raced dune buggies in the sand. I’m certain the tree cover wasn’t helping my gps point me in the right direction, but I felt like I searched every little crevice within 100 feet of the general location to no avail…frustrating! 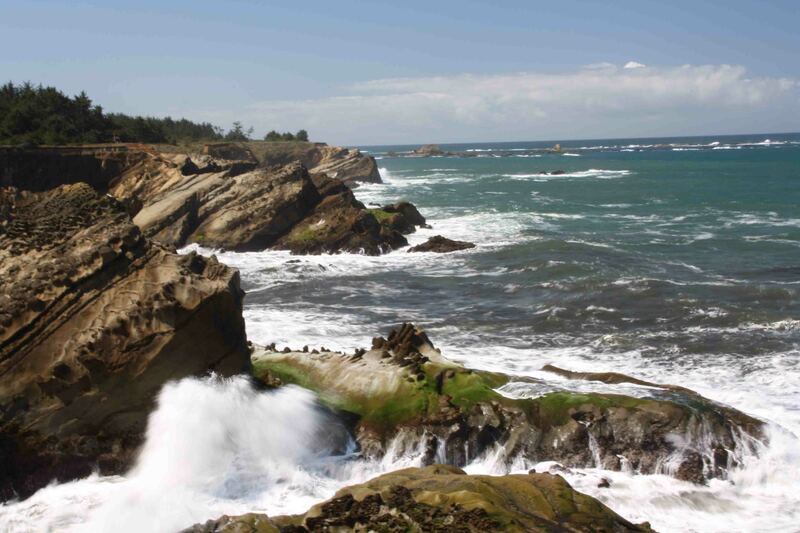 Oh well, I chose to cut my losses, enjoy some nice scenery, and then make my way toward the Sea Lion Caves. 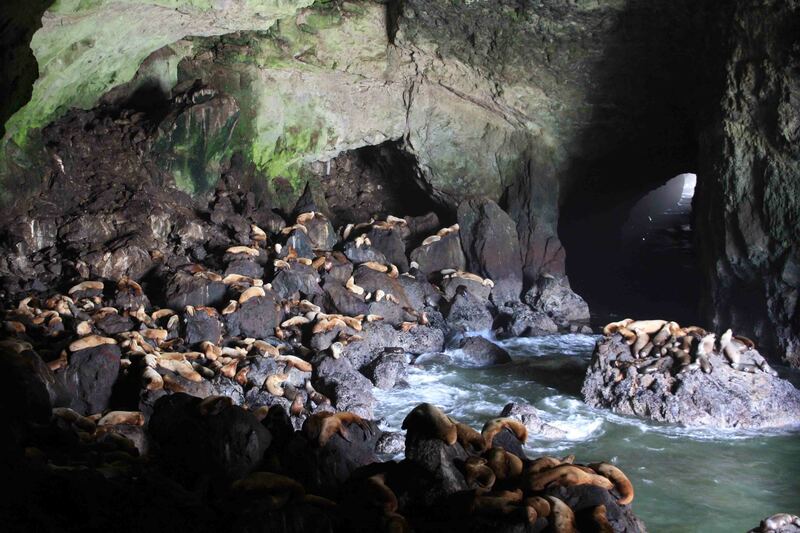 The Sea Lion Caves is actually only one cave which is the largest sea cave accessible by land. It was discovered in 1880 by a local ship captain and is one of the few places where sea lions live year-round on the U.S. mainland. An elevator takes tourists down 200 feet to an observation window that looks into a multihued cavern at sea level. Today approximately 270 sea lions barked, played, and jostled for a resting spot on the rocks. 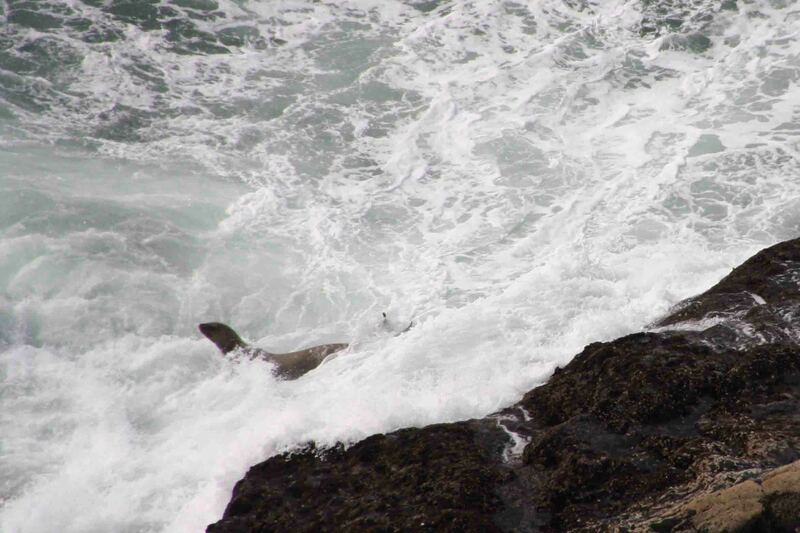 Additional sea lions could be found a few hundred yards from the cave surfing the waves and sunning on the shore. The Steller sea lion is the largest species of the eared seal family and live 20-24 years. Bulls weigh 1,500 pounds and may weigh more than a ton while cows weigh between 500 to 700 pounds. Babies weigh nearly 50 pounds when they are born. Its range is from San Francisco to the Bering Strait. The bulls sometimes swim over 4,000 miles to winter in Alaska before returning to Oregon to mate in the late spring. 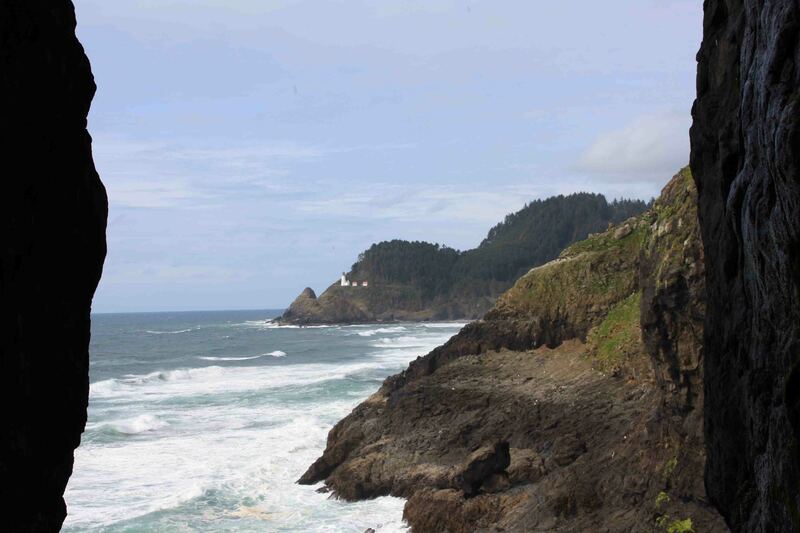 One of the cave’s natural windows provides a view of the Heceta Head Lighthouse. 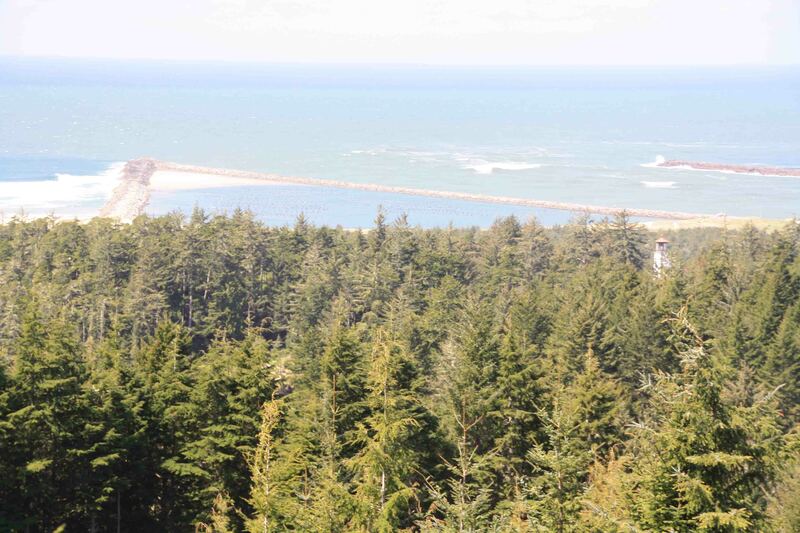 Oregon’s most powerful beacon flashes its one-million candle power every ten seconds and can be seen as far as 21 miles at sea. Built in 1894, it is said to be the most photographed lighthouse in the world. After visiting the caves, we retraced the coastal drive to the south making a short stop in Florence for a few geocaches and then went on to Eel Creek Campground located in Oregon Dunes National Recreation Area where we found a trail that led us to the dunes, through some foliage, past a small pond and back to VANilla. 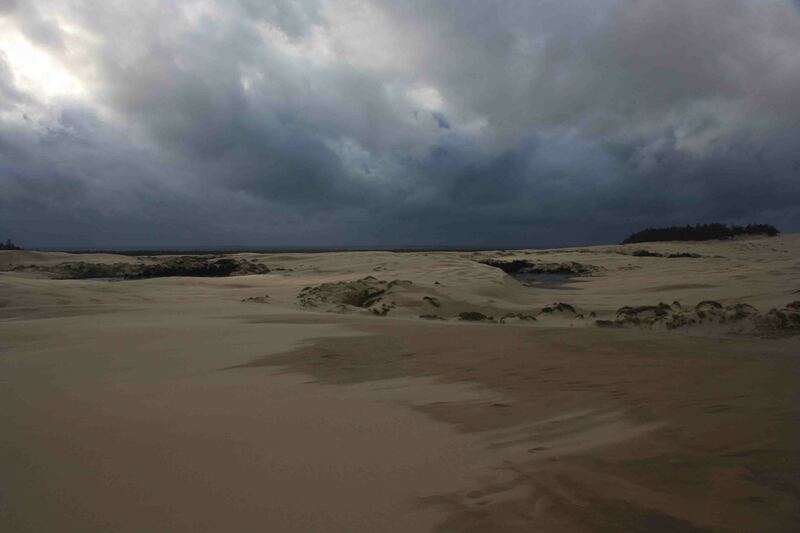 was blowing so hard, sand was driving into our side and practically filled our footprints before our return. Petey was less than pleased with me for taking him on this walk! As I was returning, all I could think of was poor souls traveling through the desert and wondered what landmarks they use to find their way after days of being gone as the dunes continually change. I guess that’s where navigation by the stars would be helpful. Great pics! Love the sea lion photos!